Calliope (Coalie) is a stunning F2b Labradoodle. She weighs 45 lbs, has OFA EXCELLENT hips and normal elbows. She is clear by DNA test for PRCD and vWD. She is kind, calm, smart and very gentle. Her will puppies possess these attributes along with thick and lustrous coats. Nash is an awesome Australian Labradoodle with a delightful temperament, excellent coat, beautiful build and fantastic health testing. He weighs 20lbs. He has OFA EXCELLENT Hips and Normal Elbows, has a Clear CERF and is PRCD and vWD clear. 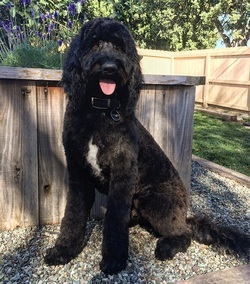 Thank you Becky and Lovable Labradoodles for the use of this special stud.